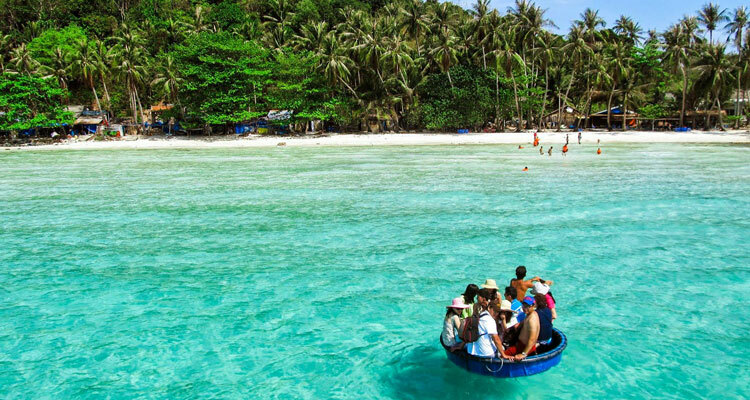 Cham island, lying 15 km from Cua Dai beach and has been recognized as a UNESCO biosphere reserve in the world. . Cham Island consists of 8 islands: Hon Lao, Hon Dai, Mo Hon, Hon Kho Me, Hon Kho Con, Hon La, Hon Tai, Hon Ong. Coral reefs of Cham Island marine are also highly appreciated and taken into protection list by scientists. Here are the important things you should know about a Cham island snorkeling tour. 1. When will we go to have a trip of Cham island tourism? 2. Vehicles for coming to Cham Island? 3. Accommodation in Cham Island? 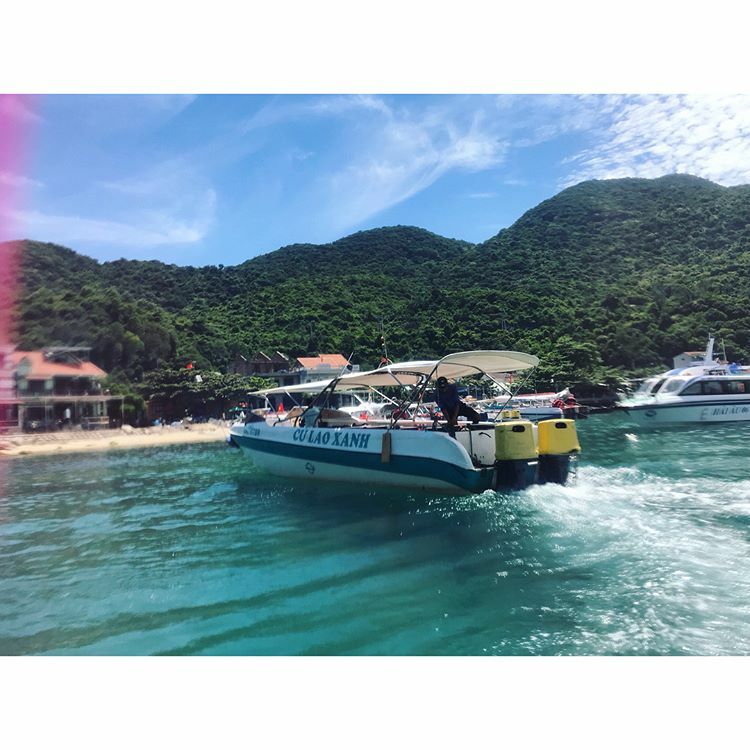 If you decide to have a Cham island tourism trip, you should go in the summer to enjoy the cool air and the feeling of jumping into the cool waters of the beach. Also, you can have a trip on 15th of each month for sightseeing and enjoying Cham island’s specialties: breast snail. In the summer, you can enjoy the cool air of Cham Island. From Hoi An, you have 3 kinds of vehicle for coming to Cham Islands: canoes, wooden boat and small boat. If you choose canoe it will take you only 20 minutes, but it is more expensive. Another option is wooden boat. This means fare cheaper than cano, about 200,000 – 250,000 VND/ round trip. With small boat, it is the same as wooden boat, slower moving boat will take you about 1 and a half hour or more. 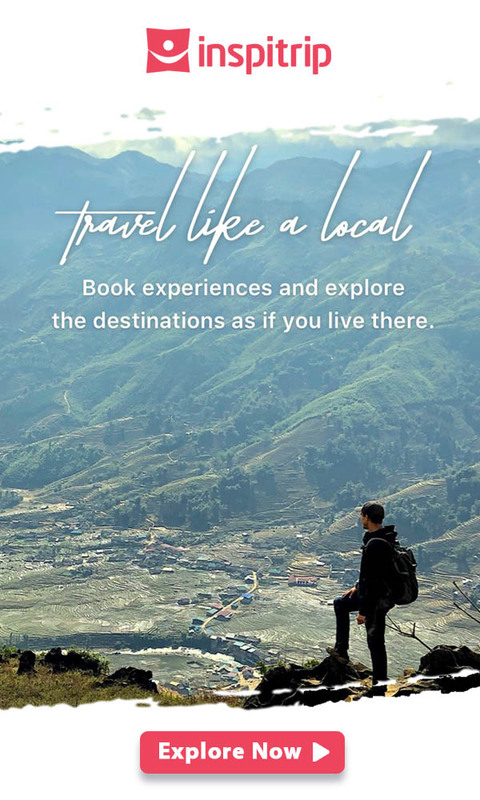 In this way, you only pay 80,000 VND / way which is cheaper than many other means. 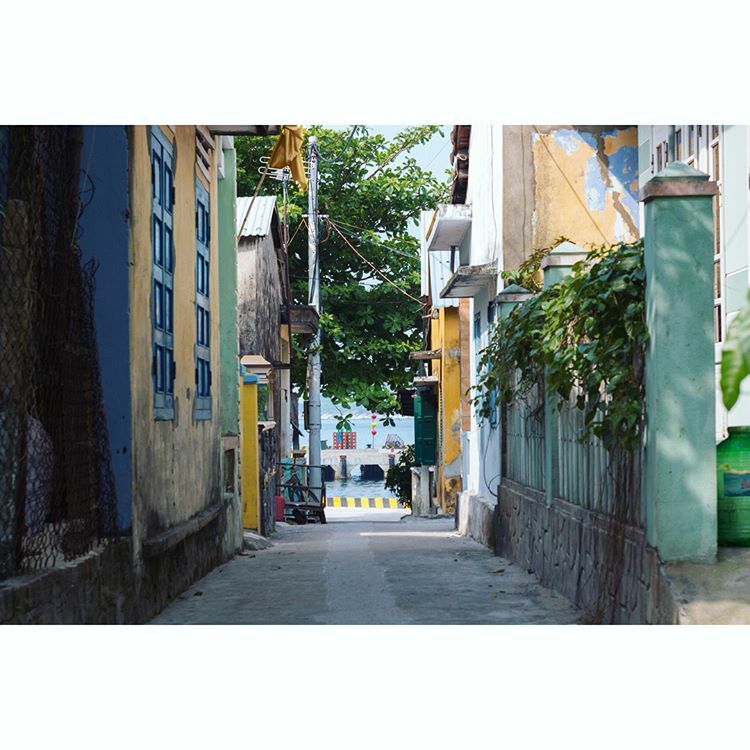 On Cham Island, there is no hotel or resort, just homestay. Their style is very suitable for tourists who want to explore the beauty of this green island. The cost for renting a homestay is very cheap, just 150.000VND-200.000VND / 1 person. You can have some suggestions through this article. A homestay in the neighborhood is worth trying. This is one of the most popular Cham Island one day tour for those who love challenge. This new service has been explored by SeaTrek Vietnam since 5, May 2016 at Cham Island. The main purpose is to explore the oceans, hundred species of fish and colorful corals. Especially, this activity is for everyone, even if you cannot swim / do not know how to dive, want to experience the ocean floor and discover all wonders, want to feed the fish. Besides, the tourists at the age of 80 can also join this service. 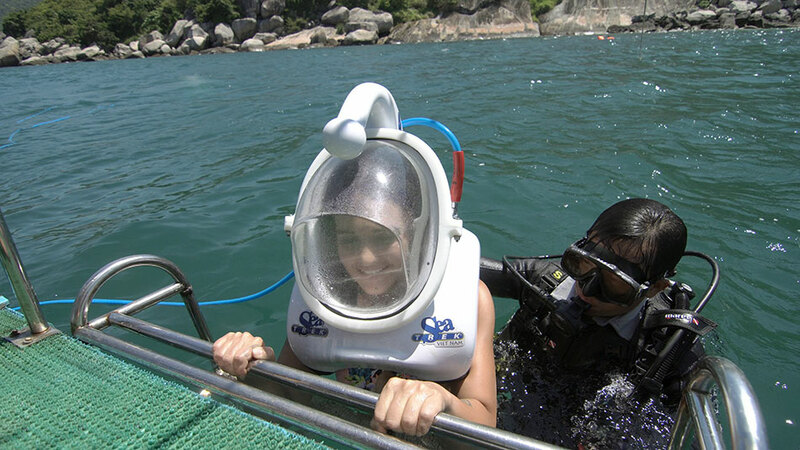 Tourists are equipped “Sea Trek” helmets (produced in the United States) which have transparent shield for easily observing the marine life. This helmet has the weight of 32kg, but when in the sea, it only weighs about 7kg because of water pressure. This is a special period for tourists to experience and understand why Cham Island is recognized as the world biosphere reserve. Unlike regular tours which have only simple activities, Sea Trek Vietnam promises to give tourists new experience “walking undersea” at Nhon Island. With our ocean walk service. Tourists have the opportunity to enjoy a tour with international stature, live with wild natural landscape which is so unique in the central coast of Vietnam. Our tour begins at Cua Dai wharf by Vietnamese traditional boat. The Boat has 48 seats, It takes about 1 hours. On the deck, you have time for relaxing and sight seeing. At the location, the Guests can swim, snorkel. The towels are prepared for all the guest. You will move to Bai Chong beach to relax and have a lunch. After lunch, guests can swim or just relax in the hammocks. The tour finishes around 3 pm. 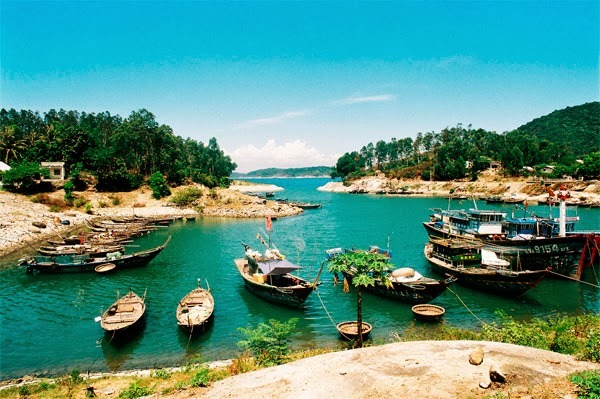 Not many tours to Cham island by Wooden boat as Sea Trek tour. In this tour, we just focus on relaxing, swimming time. You will have more time to enjoy yourself after a hard working year. In this tour, we just focus on relaxing, swimming time. Coming to Hoi An, you should try visiting a fishing village and take part in some activities of fishermen here. You will be taken out to sea in the early morning and are shown how to throw nets, catch fish and enjoy some fresh food on board. You can also breathe the fresh air of the sea, listen what is the sea saying, wait and observe the wonders. Besides, tourists also have the opportunity to have lunch with fresh seafood dishes with high quality. All of them will bring to you a great experience in your holiday. Finally, the high-speed boat will take tourists back to the mainland and transfer you back to the original venue.